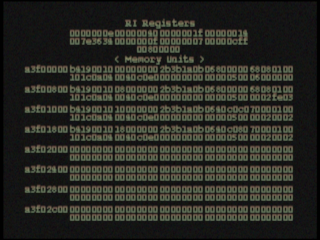 This tool was designed to read exposed values on each of the RDRAM modules the console can “see”, printing details about hardware registers you never knew you were interested in. The point of this is twofold: firstly, to help determine what remarked chips in later consoles actually are, and secondly, as a sort of diagnostic tool to help figure out what went wrong when installing on a board. CIC type is 6102 (NTSC Mario) and output is exclusively NTSC. A standard controller is only necessary to switch pages, but in all likelihood this will be unnecessary. This tool requires SRAM on-cart in order to save the results, both for display and for later use. Surprise surprise, fiddling with hardware registers on the same rdram running your code is not the brightest of ideas, so alternate available memory needs to be used for this purpose. If you’re using a flashcart that automatically sets the save type based on gameID, this one matches an existing SRAM title to save you maybe clicking a toggle or something. Use this tool on console. Emulators don’t emulate RDRAM at this low a level, and iQue uses different memory altogether. The readme contains details on what values are printed to the screen and how known registers are organized.